the instructions say to put the red end of the 3.5mm connector cable (2 lines) into the headphones and the other end (black, 3 lines) into the audio device (e.g. laptop, phone, etc). but when i did this and turned up the bass using the slider on the left headphone speaker, i couldn't hear any bass unless i held in the embossed skull button on the cable. here's my amazon review for the skullcandy crusher headphones. Is it normal that I have to jack up the volume to a pretty high volume (which probably might hurt my ears) to get the bass amp going? 'cause when listening to music with "normal" volume, the sliding the slider doesn't have any changes to the bass, which is the minimal level. i don't think so. it could just b that the songs r mastered in a way that the bass levels aren't very high--unless u've compared the levels w different headphones n notice a considerable difference. I have the same concern.....I have to turn up my bass up to 100% just to feel any bass on some of my EDM songs :/...50 out 500 songs actually have "crazy amount" of bass when slider is too up. The crusher is made of two parts inside there is the bass driver and the primary sound driver. Turning up the slider will make the bass driver to create the high quality bass. When the sound is high with the bass all the way down the primary driver will give some bass but not the true experience. If yours stops working try switching batteries or bend the recivers that touch both ends of the battery. What happens is that they get bent back where they don't touch anymore so that could be the problem. 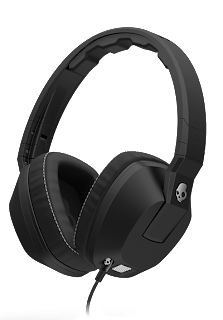 My bass stopped working so you can go to skullcandy .com and fill out a form and ship the headphones back and they will refund you with new ones. Hope this helps mine broke and it sucked. No matter what my bass won't work. Any ideas why? I had changed the battery and was starting to get really sad. Thank you so much! I just bought a pair and had the same problem. Your tip solved it.